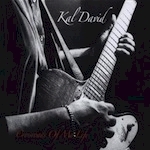 Kal David combines the past (Fabulous Rhinestones, Illinois Speed Press) and present with blazing guitar and fine wine vocals on this blues legend's latest CD! Backed by NY Rhythm section of keyboardist Adam Klipple and drummer Mike Nappi, Kal is also joined by Lauri Bono's featured vocals, production, writing and arranging skills. Copyright 2011 © Crytone Records. All rights reserved.